The Parenting niche is massive. Parenting is the hardest job in the world and it often comes with it’s share of problems. There are parents all over the world looking for advice and tips to make parenting easier. These articles can be used on your own blog or website or can be rewritten and then submitted to article directories. If you are in the Parenting niche then these are the articles you need for your business. These articles range between 300 and 600 words each. 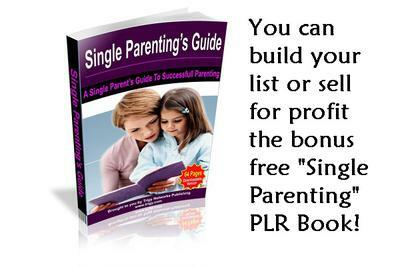 And as a free bonus you also get a PLR book about Single Parenting Guide to give away to build your list, or sell for profit, or use the content on your blog. On Sale - For just $7you will receive your articles in just a few minutes and can put them to work straight away.